Though Thai civilization dates back to 3600 BC, Thailand only announced its independence around 1238 when the Great King Intaradit founded the Sukhothai Empire and the rule of the Khmers came to an end. Since then the Lanna Kingdom was founded at Chiang Mai and from around 1280, ancient Thailand under the rule of King Ramkamhaeng, a descendant of King Intaradit, enjoyed great prosperity during the so called golden age. Today HM King Bhumibol Rama IX is the reigning monarch since 1946, the 9th King in the Chakri dynasty. It makes him the longest reigning monarch of the modern world and much loved and revered by Thais. Here we have compiled a list of ancient places to see in Thailand you absolutely have to visit, including temples, historic cities and Wat's (temple compounds). Especially in Chiang Mai which is the historic capital of Thailand, places like Kanchanaburi which include the infamous WWII death railway and hell-fire pass, Ayudhaya which was the capital if Siam located approximately 3 hours from Bangkok and Sukhothai, also a former city kingdom will resonate well with visitors who enjoy history. 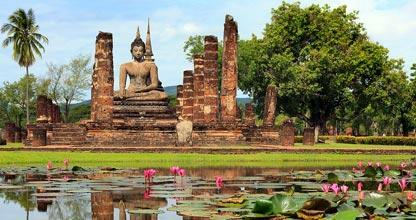 Ayuthaya is located 3 hours from Bangkok and a must see historic site. Until approximately 350 years ago Ayuthaya was the Siamese nation's capital and flourished in commercial trading until it fell to the war making Burmese in 1767. Shortly after this the capital was moved to an area what became the Bangkok we know today. 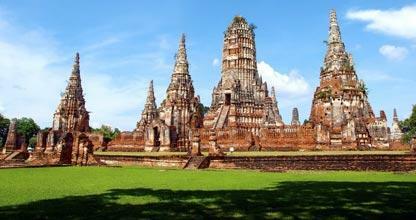 Ayuthaya is a UNESCO heritage site showcasing fascinating temples and remaining ruins of the city. Sukhothai was part of the Khmer empire until approximately 800 years ago when 2 Thai chiefs declared their independence and established this Thai-ruled kingdom to see the birth of the Thai nation. Other less known Thai kingdom, such as the Lanna kingdom, Phayao and Chiang Saen were established around the same time. Forming alliances with them Sukhothia expanded and adopted Theravada Buddhism as the state religion. Ban Chiang is another UNESCO site located in Udon Thani Province. 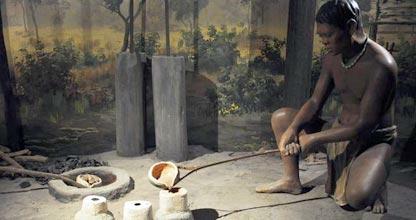 It was discovered as recently as 1966 when ancient pottery in the area was found by chance. Graves and artifacts that were subsequently unearthed indicates that the area and some of its earliest inhabitants dates back to the iron age. 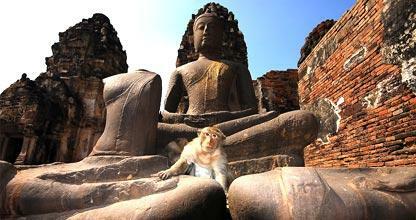 The history of Lopburi dates back to the Dvaravati period more than 1000 years ago. The oldest ruins that can now be found are all Khmer Temples since all preceding structures were destroyed when they invaded the area. Today this ancient location is most famous for its Crab-Eating Macaques. 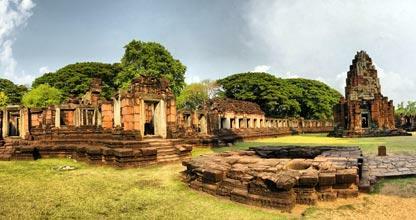 The Phimai historical park feature the most important Khmer temples of Thailand. It is located in the town of Phimai, Nakhon Ratchasima province. The temple marks one end of the Ancient Khmer Highway from Angkor. 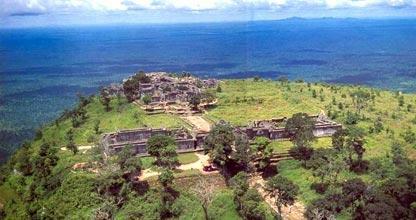 The Khemer Prasat Khao Phra Viharn Temple is situated on top of a 525 meter cliff in the Preah Vihear province of northern Cambodia near the border of Thailand. The the International Court of Justice recently awarded ownership to Cambodia. 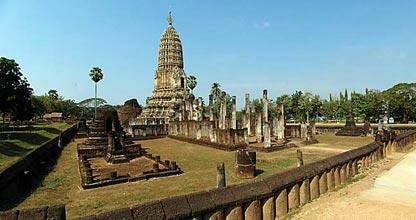 In the northern most district of Sukhothai province along the Yom River is the city of Si Satchanalai. Considered the twin city of Sukhothai, this was also where the seat of governance used to be and home of the crown prince of the time.